All branches are collecting cold-weather mittens, hats, scarves and gloves from now through December 31, 2018. 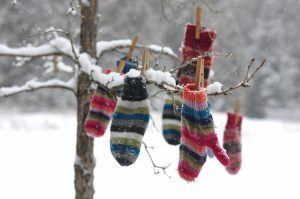 With cold weather moving in and the holidays approaching, sister banks, Merrimack County Savings Bank (the Merrimack) and Meredith Village Savings Bank (MVSB), will collect mittens, hats, gloves and scarves for their annual Mitten Tree drives. A donation of $2 for every item collected through December 31st will be awarded to the NH Food Bank, and earmarked for the communities served by the Banks. New handmade or store-bought mittens, hats, gloves and scarves can be dropped off at the Merrimack and MVSB from now through December 31st. Non-profits who are in need of mittens, hats, gloves and scarves should contact the Bank office closest to them. Complete lists of offices and hours are available at themerrimack.com and mvsb.com. Merrimack County Savings Bank and Meredith Village Savings Bank are mutual community banks without private owners or stockholders. They have remained steadfast in fostering the economic health and well-being of the community for over 150 years and share in the values that guide all of their actions: accountability, mutuality, excellence, respect, integrity, teamwork and stewardship.